This post will focus on actions at the Commonwealth level, with future posts discussing state or watershed-level actions. Australia has a national population of 22.5 million, the overwhelming majority of which live along the coasts, especially in the southeast. The continent is very dry or semi-arid in most areas except the northeast, which is tropical. Major consumptive water uses include irrigated agriculture (65%), residences (11%), system losses (11%) and manufacturing (3%). In recent years, water supplies have been stressed because of a decade-long drought, increasing population, over-allocation of certain sources, land use modifications and climate change. Australian water policy-makers generally believe that climate change has already impacted water resources in the country, and those impacts will accelerate in future. Prior to 1989, water in Australia was managed almost exclusively by the states, with little Commonwealth involvement. Pursuant to the Australian Constitution §100, water rights are established and allocated by the states, and state or local agencies own, operate and finance most water infrastructure. 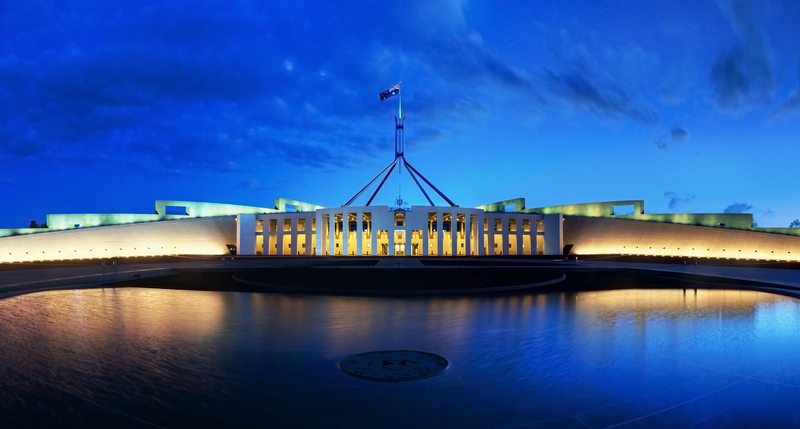 Exclusive state management began to change in the early 1990s, culminating in a water reform framework being adopted by the Council of Australian Governments (COAG) in 1994. Further development of that framework led to execution of the National Water Initiative (NWI) in June 2004 by the Commonwealth, the states of New South Wales, Victoria, Queensland and South Australia, the Australian Capital Territory and the Northern Territory. The states of Tasmania and Western Australia were not original signatories, but executed the NWI in June 2005 and April 2006, respectively. The NWI was not driven by one political party, but received support from governments of different parties at the time. While the NWI did focus attention on the Murray-Darling Basin (the largest multi-jurisdictional watershed in Australia), many of the policies it adopted can be applied across the nation. Institutionally, the NWI established the National Water Commission (NWC) to oversee implementation of the agreement. Each signatory was required to develop an implementation plan within one year of signing the agreement, to be reviewed by the NWC for consistency with the NWI. Thereafter, signatories were required to take specific legislative and regulatory actions to accomplish the NWI in accordance with a strict schedule. Interestingly, the parties also agreed to use a common lexicon for water use and management, including a list of defined terms, which can be quite useful for cooperation in a multi-jurisdictional setting. The NWI contained a number of substantive policy statements that were agreed to by the various governments. While many of the policy statements are high-level in nature, the NWI anticipates that they would be manifested in more specific Commonwealth, state and territorial laws and water management decisions. Highlights of the policies recognized or adopted in the NWI are described below. Consumptive use of water requires a water access entitlement. States should clearly specify the nature of water access entitlements. States must separate water access entitlements from land titles. Water access entitlements must be perpetual, exclusive & enforceable. States must create public registers in which entitlements are recorded. Water access entitlements should be share-based, with periodic allocations to account for supply shortages. States should make express provision for environmental water. States should create water access entitlements that are compatible across jurisdictions to improve investment certainty, be competitively neutral and minimize transaction costs on water trades. States should clearly assign risks arising from future changes. Water users should bear shortage risks from drought or climate change. Governments should bear shortage risks from changes in policy. States should create markets that allow efficient water trading. Water markets should allow trading within and across jurisdictions. Water markets should minimize transaction costs. Water markets should be allowed to develop a mix of products, including short-term leases and permanent transfers. Water markets should protect third parties and the environment. Water should be priced to promote efficient and sustainable use. Prices should be set so that users pay the full cost of water delivery. Market-based mechanisms should account for positive and negative environmental externalities associated with water use. Water prices should be transparent to avoid unintended outcomes. Prices should be consistent across jurisdictions within trading markets. Pricing subsidies should be minimized and publicly reported. States should separate the functions of water delivery and regulation. On an annual basis, states and territories must publicly report water pricing and service quality for urban, rural and irrigation utilities. Certain prices or price setting processes by government or private water service providers should be reviewed by an independent pricing regulator. Governments should identify environmental and other public benefit outcomes sought for water systems. Water managers should have the authority and resources to achieve those outcomes, including the ability to clearly measure success. Environmental programs should undergo periodic review and reporting. Governments and private parties should be able to trade water in the market for environmental purposes. Managers should recognize surface and groundwater connections. Water systems must allow accurate measurement and reporting. Water metering should be undertaken in all trading markets. States will adopt a water efficiency labeling scheme for appliances. Managers should involve the public for education and accountability. Several of the policies summarized above are noteworthy. First, the NWI clearly recognizes the value of water access entitlements and trading markets for resource management. In many jurisdictions, including the US, there is a reluctance among many water managers to commit to firm entitlements and market-based systems. (For example, see my earlier post on the use of economics in water management.) The NWI is unique in global water management by clearly stating the value of market-based approaches and doing so with the support of diverse political parties. This should be encouraging to economic liberals everywhere and cause economic traditionalists and progressives to seriously question their opposition, especially in light of Australia’s proven ability to survive a severe drought following implementation of the NWI policies. It appears that six years following the NWI, there remains a healthy consensus in favor of market-based approaches to water management. Second, the NWI firmly and consistently asserts the need for environmentally sustainable water use, but does so in a positive and confident manner, without the histrionics often associated with modern environmentalism. The focus is on expressly identifying desired environmental outcomes, writing environmental water needs into basin plans, using markets and pricing to create positive incentives for environmental sustainability and periodically evaluating environmental programs for their success (or failure). Using such a positive and economically rational approach allows the NWI to appeal to economic liberals like me, as well as more traditional environmentalists for whom economic rationality is at most a secondary concern. This is an alliance that has been underutilized in many places, as the environmental side has been infiltrated by economic progressivism, and economic liberals have failed to reach out to environmental advocates as potential allies. Third, the NWI recognizes the need for risk identification, allocation and adjustment strategies for future changes in water availability. The concept of risk is handled well in Australia and many other parts of the world, but typically quite poorly in the US. We generally fail to speak in terms of risk, with multiple stakeholder groups each wanting more certainty for their interests than is possible in light of competing water uses and highly variable and changing water resources. Without using the language of risk, we cannot optimally allocate shortages between water users or create effective adjustment strategies that rely upon risk to assign responsibility for certain actions and financial obligations. I believe this failure to think in terms of risk also leads US governments to forego the benefits of public-private partnerships and other infrastructure delivery methods, which I will address in a future post. Since 2004, the NWC, COAG and individual governments have taken numerous steps toward NWI goals. The NWC conducted a First Biennial Assessment in 2007 and a Second Biennial Assessment in 2009, with variable results. As might be expected, some water managers are calling for redoubled efforts to accelerate the pace of water reforms in accordance with the NWI, while others accept slower progress as more practicable. In a nation where states and territories exercised exclusive control over water resources for roughly two hundred years, there has also been pushback against perceived Commonwealth overreaching. In all, however, there does seem to be a consensus in Australia that the policies adopted in the NWI were positive and should continue to be implemented. Beyond the NWI, the Commonwealth has participated in water management mostly through funding programs. These programs are administered by the Department of the Environment, Water, Heritage and the Arts, and the largest is called Water for the Future. Water for the Future includes Commonwealth funding of AUS$12.9 billion over 10 years, including $5.8 billion for agricultural efficiency improvements, $3.1 billion for environmental water purchases, $1.5 billion to secure urban water supplies, and $56 million to improve the National Water Market. Urban water supply efforts include funding for desalination, water recycling and stormwater harvesting projects and research. Funding has been provided to erect the National Centre of Excellence for Desalination in Perth and the Australian Water Recycling Centre of Excellence in Brisbane. The National Rainwater and Greywater Initiative is providing rebates and grants directly to citizens for installation of rainwater and greywater systems, and Water Smart Australia is funding water efficiency improvements for cities and towns, including smart technologies and water use practices. The Australian model for increasing environmental flows, as represented by the Restoring the Balance initiative in the Murray-Darling Basin, is to use tax funds to purchase water access entitlements from their private owners. This approach guarantees that environmental benefits are paid for by all Australian taxpayers, rather than only owners of water access entitlements, which is consistent with the concept of having benefitted parties pay. One could, of course, drill down into that policy by determining the proportional benefits received by Murray-Darling water users (in the form of greater water reliability) and members of the public inside and outside the Murray-Darling Basin (in the form of environmental enjoyment and preservation). This approach is also consistent with the NWI policy of having governments bear the risk associated with policy changes. Once purchased, water access entitlements are held by the Commonwealth Environmental Water Holder (CEWH), who is responsible to independently manage those entitlements to achieve optimal environmental benefits. I believe that Restoring the Balance is a good model to benefit the environment while respecting water entitlements and furthering water markets. There have been complaints about environmental water purchases increasing prices for private water users in the trading market, and DEWHA buying entitlements from certain large water users and thus concentrating payments, but these are rational outcomes of the program rather than legitimate criticisms. In addition, the current elections have generated some questions about the reported amount of water purchased to date, but that is an implementation issue that should not detract significantly from the benefits of the overall program. One legitimate question is whether Water for the Future is fully consistent with the NWI. Many NWI policies relate to full-cost pricing of water services and using price signals to properly incentivize efficient water use, both of which are undercut by subsidies for water projects. The $12.9 billion being contributed by the Commonwealth via Water for the Future represents a significant subsidy paid for by general tax revenues rather than water users. While the focus of Water for the Future is on research and demonstration projects, and that may be a legitimate governmental function, large quantities of money are also being used to subsidize specific projects. Geographically, the focus of Water for the Future is on smaller towns and rural areas rather than urban areas, and there is an argument that rural areas are less able to afford the full cost of water. Although from a purist perspective it would have been better to avoid such subsidies, they may have been needed to avoid rate shock, given the massive water investments necessary to survive the droughts of the last decade. There has been some discussion of weaning Australian water users from subsidies in future, and hopefully that will be implemented. One last area in which the Commonwealth has asserted new power over water management is in the Murray-Darling Basin. That basin is located in the southeastern center of the continent and serves as the most important agricultural area in Australia. 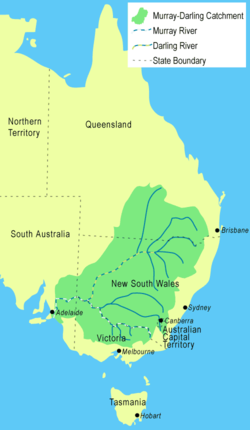 Due to over-allocation of water resources in the past and the fact that the basin extends across multiple jurisdictions (Queensland, New South Wales, Victoria, South Australia and the Australian Capital Territory), it was determined that the basin should be primarily managed at the Commonwealth level rather than by the states. A new organization was formed to accomplish this, the Murray-Darling Basin Authority (MDBA). I may come back to management of the Murray-Darling Basin in a future post, but for now the most important topic is the pending release of the draft Murray-Darling Basin Plan. Release was scheduled for early August, but has been postponed until after the 21 August 2010 elections, since MDBA has entered the caretaker period. One criticism of the plan has been its method of development. The MDBA has largely drafted the plan by itself, without significant stakeholder involvement, and plans to solicit stakeholder views as part of comments on the draft document. Various stakeholders are concerned that by the time the draft document is released, certain commitments may have been made that would be difficult to undo, and thus their participation may be limited. This is always a difficult issue, but hopefully can be successfully resolved in this case. As you might have guessed from the discussion above, I support many of the actions taken by the Commonwealth for water management, especially its leadership toward negotiation and implementation of the NWI. That document is a fantastic example for other jurisdictions looking to reform their water policies. There are few areas where I would disagree with the policies it contains. Of course, the devil is often in the details, and I understand that implementation of the NWI policies has been slow in certain policy areas at both the Commonwealth and state levels. Nevertheless, some movement toward good water policies is better than none, and Australia seems to be headed in the correct direction. 1. Have you done a longer critique/review for any law review? If so, I would like to read it. If not, I strongly recommend you consider this suggestion. 2. Given your general support for their approach to purchasing water for ecosystem purposes, have you thought about what a California compartable approach might be? I would welcome your recommendations for us as the Delta Stewardship Council begins to develop a legally-enforceable Delta Plan. Keep up the blog please. Thanks for the kind comments. In answer to your questions, no, I have not written a longer piece on the Australian experience, but hope to have the time to write some additional posts on this blog. I would love to have the time to write something longer also, perhaps I will find the time in coming months! As far as a comparable California approach, it seems we are a fair ways off from the Australian progress toward certainty in water entitlements. We are inching there, e.g., the new law that requires reporting of all surface water diversions, but very slowly. I don’t see much movement toward a large-scale environmental water purchase program currently, especially given the state’s financial condition. Australia has been fortunate to avoid the worst of the GFC so far, and that has helped. Of course, in the Murray-Darling there was great concern that the new Basin Plan (first peek is due on Friday, 8 October) would cut water entitlements without any compensation to benefit the environment, but the government seems to have backed away from any such plan. The unpopularity of such an approach during the recent election period probably helped. I will likely be reviewing the Delta Plan as it comes out and providing comments on behalf of clients, although their interests may not reach the full range of discussion on this blog, of course. Along the lines of Mr. Isenberg’s post, is there a specific project in the USA context comparable to the Great Artesian Basin Sustainablitiy Initiative? However, I couldn’t find any large-scale project (so far) that is on par with GABSI. I cannot think of a basin in the US that faces the same challenges as the Great Artesian Basin, largely because of the unique hydrogeology of that basin. There are, however, a number of basins in the US that are subject to intense management. A couple of good examples are the Chino Basin in California (http://www.cbwm.org/) and the Edwards Aquifer in Texas (http://www.edwardsaquifer.org/). Both of those are helped somewhat by the fact that each basin is located entirely in one state; interstate basins have been much more difficult to manage.